The final two pieces of the Cardinal Commitment: Developing Champions campaign, which was originally announced in April 2013, are set to be completed within the next year and a half. Designs for both the Earl Yestingsmeier Golf Center and the Dr. Don Shondell Practice Center were presented and approved at the Board of Trustees meeting Feb. 3 and each project will begin with construction in the next couple of months. The Earl Yestingsmeier Golf Center, set to be completed in late 2017, and the Dr. Don Shondell Practice Center, with a completion date for late summer 2018, are the final two pieces of the $20.6 million fundraising campaign that was first announced approximately four years ago. Sandy took over as Ball State’s director of Intercollegiate Athletics in February 2015, right after the financial goal for the campaign was met. Since then, the campaign has helped build new facilities for the football, baseball and softball teams and upgrade Worthen Arena. When these two new facilities are completed, Sandy said it will set Ball State apart from the rest of the Mid-American Conference in terms of upgrades. The new home for the men’s and women’s golf teams is expected to be completed at some point between Thanksgiving Break and the end of the calendar year, and will be built along Bethel Avenue on the north side of campus, just southeast of Scheumann Stadium. The $1.7 million, 6,400-square-foot facility will include two indoor hitting bays, a simulator and a 2,200-square-foot putting and chipping area for players to practice year-round. There will also be locker and restroom facilities for both teams, a meeting/office room, a team lounge and a club repair room. Many northern universities, including all but two in the MAC who have golf programs, have indoor training facilities. Head women’s golf coach Katherine Mowat said the new building will push the Cardinals ahead of their competitors. Fleck said the new facilities won't change the types of student-athletes the golf team targets, and Mowat said Ball State won't lose any potential golfers to programs with indoor golf centers. 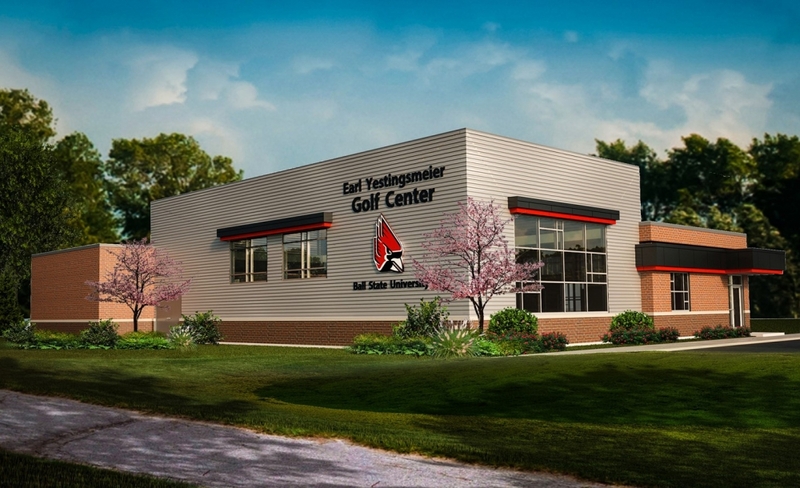 Fleck played golf at Ball State for the facility's namesake, Earl Yestingsmeier, who died in January 2014. Yestingsmeier earned his bachelor’s degree from Ball State in 1955 and his master’s in 1958. After graduating, he worked as the university's sports information director and men’s golf coach for 36 years until his retirement in 1998. 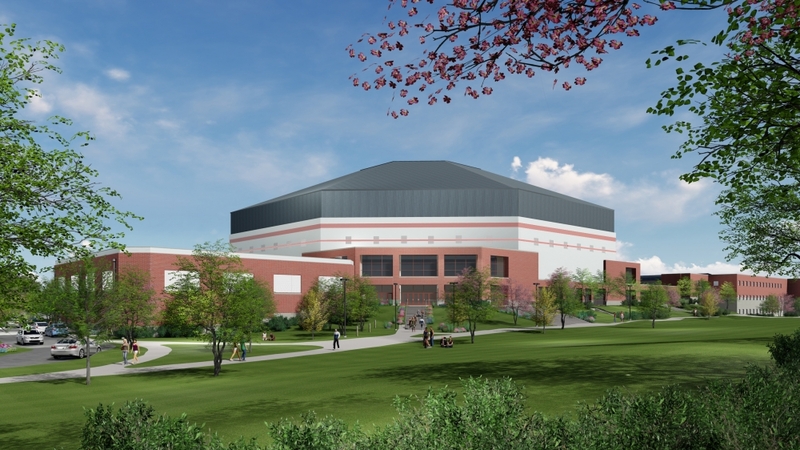 The Worthen Arena expansion will be connected to the arena’s northwest side and will house two courts for the men’s and women’s basketball and volleyball teams. Only one court was originally going to be built, but the coaches helped convince the administration to add a second court to the plans due to the amount of players who would be using the courts. The men's volleyball team, for example, has 20 players on its roster. Head women’s volleyball coach Kelli Miller said it's also difficult scheduling practices with the current setup, where four teams share the court at Worthen, because the available hours can overlap with players' academic schedules. School, naturally, takes priority, so those players have to show up to practice late and/or leave early — if they can make it at all. Ideally, the 19,000-square-foot addition will make early morning and late night practices a thing of the past. The addition will also include a training room, two team meeting rooms and a study room featuring tiered seating. The building is named after Don Shondell, a 1952 Ball State graduate and founder of the men’s volleyball program. The Hall of Fame Coach has the most career wins by a Ball State coach in any sport, 20 Midwest Intercollegiate Volleyball Association titles and the second-most wins in NCAA men’s volleyball history.